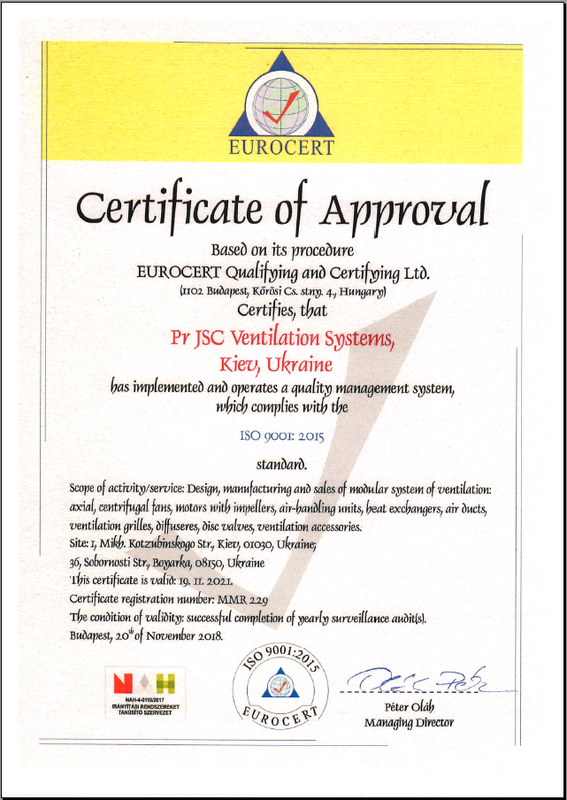 Air resistance in ventilation system is mainly determined by air speed in this system. Air resistance grows directly proportional to air flow. This phenomenon is known as pressure loss. Static pressure produced by a fan causes air motion in the ventilation system with a certain resistance. The higher the ventilation resistance in the system, the less air flow of the fan is. Friction losses for air in air ducts as well as resistance of the networking equipment (a filter, silencer, heater, valves and dampers, etc.) can be calculated using the tables and diagrams contained in the catalogue. Total pressure loss is equal to all pressure loss values in a ventilation system. Pressure loss in the duct system can be reduced due to larger duct section which provides relatively even air speed in the whole system. 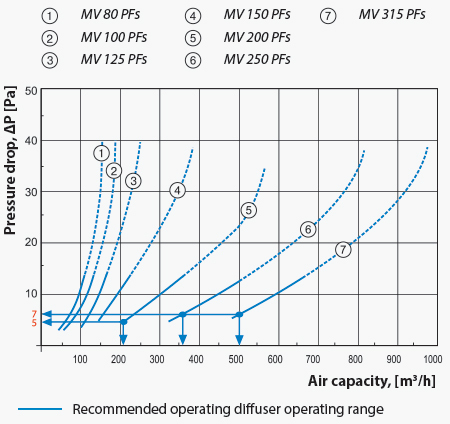 The figure below shows how to provide relatively even air speed in the duct system with the minimum pressure loss. For long systems with many ventilation grilles, install a fan in the middle of the network. Such solution has several advantages. On the one hand, pressure losses are reduced, on the other hand, smaller ducts are used. Start the calculation with the system drafting, showing the location of the air duct, ventilation grilles, fans and also the air duct section lengths between T-joint. Then calculate the air capacity at each section. 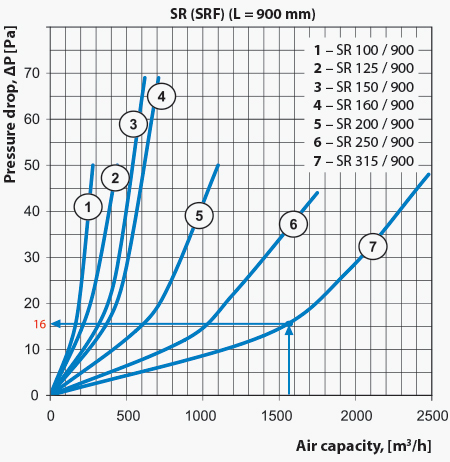 To calculate the pressure loss in the sections 1-6, use the pressure loss diagram for round air ducts. For that the required air duct diameters and pressure loss shall be determined under condition of permissible air sped in the duct. Section 1: air flow is 200 m3/h. 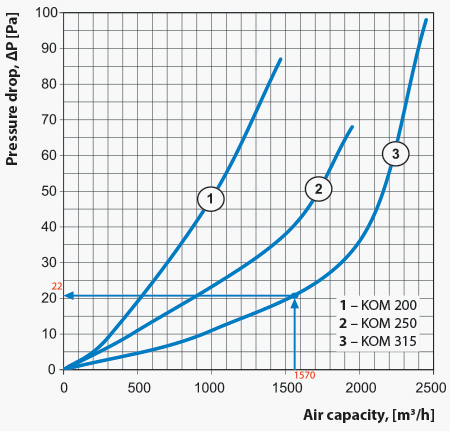 Suppose that the air duct diameter is 200 mm and air speed is 1.95 m/s, then the pressure loss is 0.21 Pa/m x 15 m = 3 Pa(refer to the pressure loss diagram for the air ducts). Section 2: the same calculations shall be performed considering that the air speed through this section is 220+350=570 m3/h. Suppose that the air duct diameter is 250 mm and air speed is 3.23 m/s, then the pressure loss is 0.9 Pa/m x 20 m =18 Pa. Section 3: air flow through this section is 1070 m3/h. Suppose that the air duct diameter is 315 mm and air speed is 3.82 m/s, then the pressure loss is 1.1 Pa/m x 20 m = 22 Pa. Section 4: air flow through this section is 1570 m3/h. Suppose that the air duct diameter is 315 mm and air speed is 5.6 m/s, then the pressure loss is 2.3 Pa/m x 20 m = 46 Pa. Section 5: air flow through this section is 1570 m3/h. Suppose that the air duct diameter is 315 mm and air speed is 5.6 m/s, then the pressure loss is 2.3 Pa/m x 1 m = 23 Pa. Section 6: air flow through this section is 1570 m3/h. Suppose that the air duct diameter is 315 mm and air speed is 5.6 m/s, then the pressure loss is 2.3 Pa/m x 10 m = 23 Pa. The total air pressure in the ductwork system is 114.3 Pa.
As the last section pressure loss calculation is over, you can start calculating pressure loss in the network elements as silencer SR 315/900 (16 Pa) and in the backdraft damper KOM 315 (22 Pa). Calculate also pressure loss in the branches to the grilles. The total air resistance in 4 branches makes 8 Pa.
Pressure loss calculation in air duct T-joints. The diagram enables calculation of the pressure loss in the branches on the basis of bend angle, air duct diameter and air capacity. Example. Calculate the pressure loss for 90° bend, Ø 250 mm and air flow 500 m3/h. 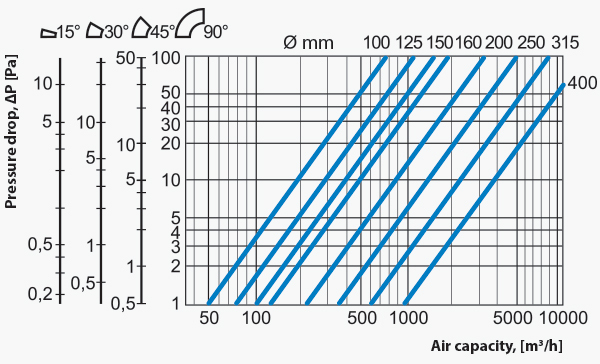 For that find the intersection point of the vertical line that shows the air capacity with the vertical line. 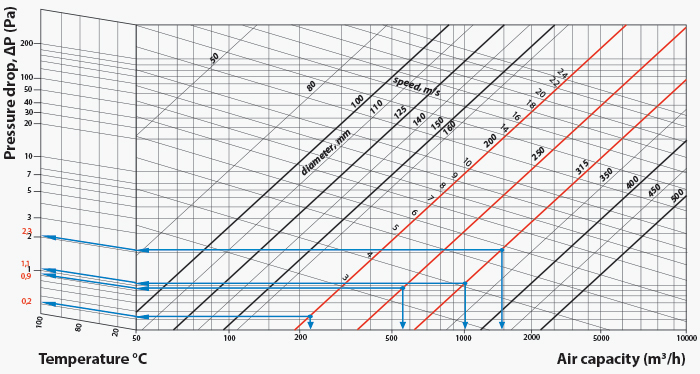 Find the pressure loss on the vertical line on the left for 90° pipe bend which makes 2 Pa. Suppose we install the PF ceiling diffusers with air resistance 26 Pa.
Now let us sum up all the pressure losses for the sraight air duct section, network elements, bends and grilles. The target value is 186.3 Pa.
After all calculations we come to the conclusion that we need an exhaust fan with air capacity 1570 m3/h at the air resistance 186.3 Pa. 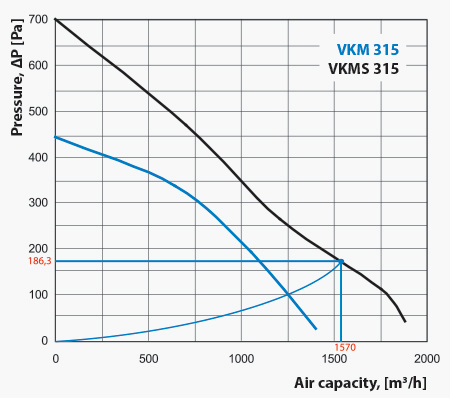 Considering all the required operating parameters the VENTS VKMS 315 fan is the best solution.